The hated summer cold has been making it's way through our house the last two weeks, never fun dealing with runny noses, itchy eyes, and generally feeling less than 100%. We've still be as busy as ever, attending gymnastics, soccer, storytime, and playground playdates all in addition to our own backyard shenanigans. Okay, so yeah, another rosé recommendation coming from some one who just enjoys drinking wine, not studying or knowing the ins and outs of vintages and grapes. Cotes du Rhone 2014 is the perfect summer wine, light and refreshing, but not at all sweet. It still has a crisp fruity taste, but doesn't make me pucker and it's just smooth. It's under $15 and has a 4 star rating on TotalWine.com, so that's something. Saint Lucifer Spice. People... I wish I would have thought to include this in a Father's Day gift post, but find a way to order it (like on amazon) and put it on everything. It's basically a hot sauce that isn't a sauce but a dry spice, read all about it here. It's pretty much perfect on everything from eggs, meat, seafood, soups, and of course bloody marys. I actually found out about it when a friend served their Bloody Mary recipe at a birthday party and actually loved it. I'm in the mimosa camp to bloodys, but this was so good I asked for the secret recipe and made them for Father's Day. And best of all, it's a local Philadelphia made product! Not Your Mother's Beach Babe Sea Salt Spray. My hair is in major need of a cut, I think I last went before the holidays. I've been living with a perpetual top knot, and this spray - which I've seen recommended on lots of beauty lists - has actually kept my hair looking decent instead of a massive frizz fest. 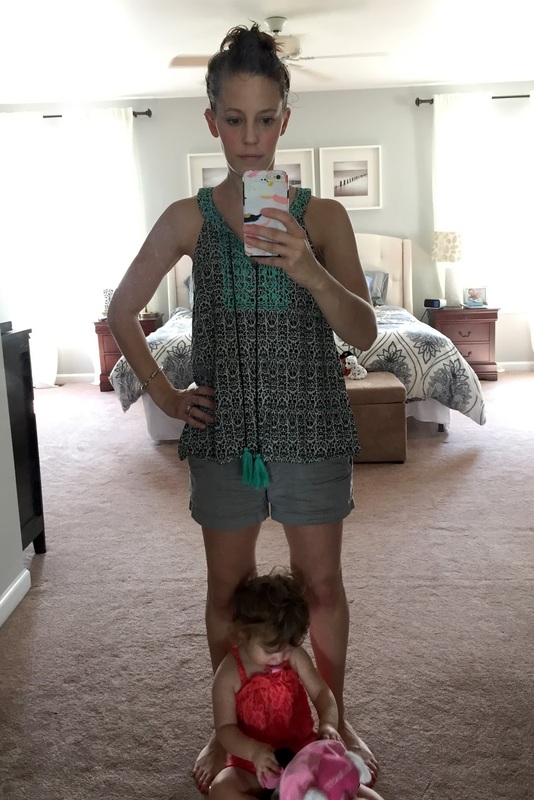 Also, not a new find since I'm pretty sure it was one of my first blogging topics way back in the day, but my goody spin pins are keeping my top knots together. When my hair gets too long, but usually messy bun is just too out of control. With the spin pins, I can actually just twist my wet hair into a bun and it'll say all day, no hair tie needed. So if you were out of the loop, consider yourself in. Nature's Bakery Fig Bars. I pick these up at Wegman's, so I'm not sure what other stores they are sold in, but with all the running around from activities to the gym to running errands, I always have at least 2 or 3 of these in my bag. They are perfect for the kids, they don't make the mess of cheddar bunnies and probably give them more nutrition too. Not to mention I love them too. Lastly, my Nanette Lepore one piece swimswuit. 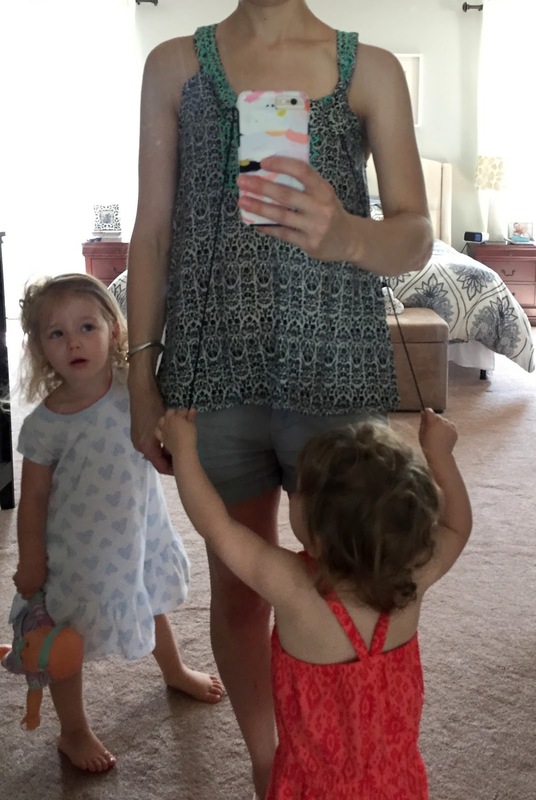 I have a hard time finding a one piece that is flattering and love this one for being stylish, but still "mom" appropriate. It's currently marked down and you can get an extra 20% with code "bananas". 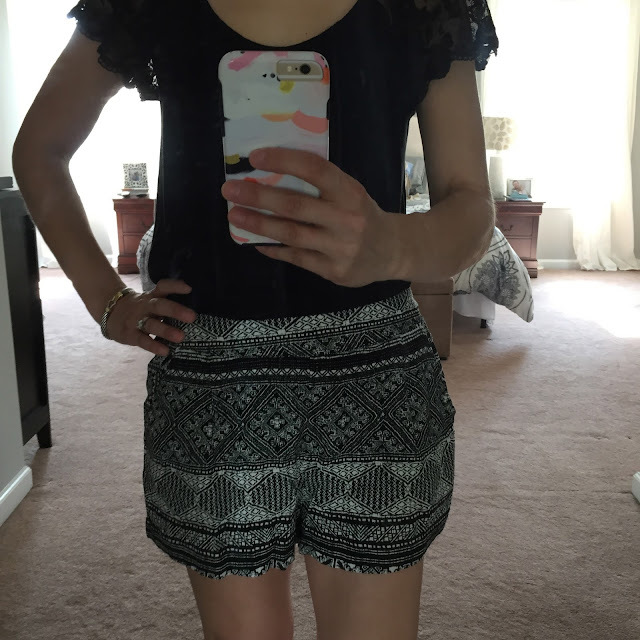 My 7th Stitch Fix came on Friday. 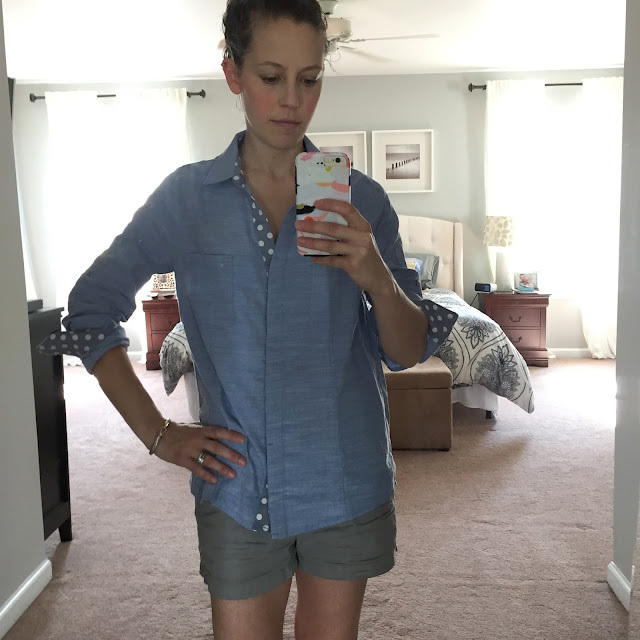 I had let my stylist know that I was no longer searching for a chambray shirt, since I scooped one up at J.Crew Factory Store, and that I was looking for summer casual tops. Breathable fabrics, as in no polyester, and was open to any shorts she might think would fit my style. When the box arrived, I always first look at the outfit card and read the stylist's note before looking at the actual clothes. Rachel said she really tried to focus on fabric content and find pieces that would be easy to care for. 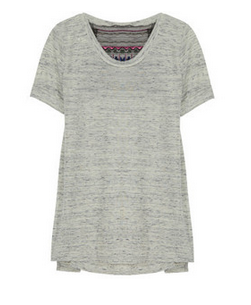 First up, the THML Christen Embroidered Tie Neck Top ($54) . It reminded Rachel of two blouses with tassels I have recently pinned to my Pinterest board. When I first saw the product shot, I thought it was cute, fairly "anthro" looking which is up my alley. I was curious to see what it felt like material wise. When I took the top out of the box I thought I would be sending it back. The hem isn't a high/low, but it definitely is a tad drapey and appeared to be higher in front. 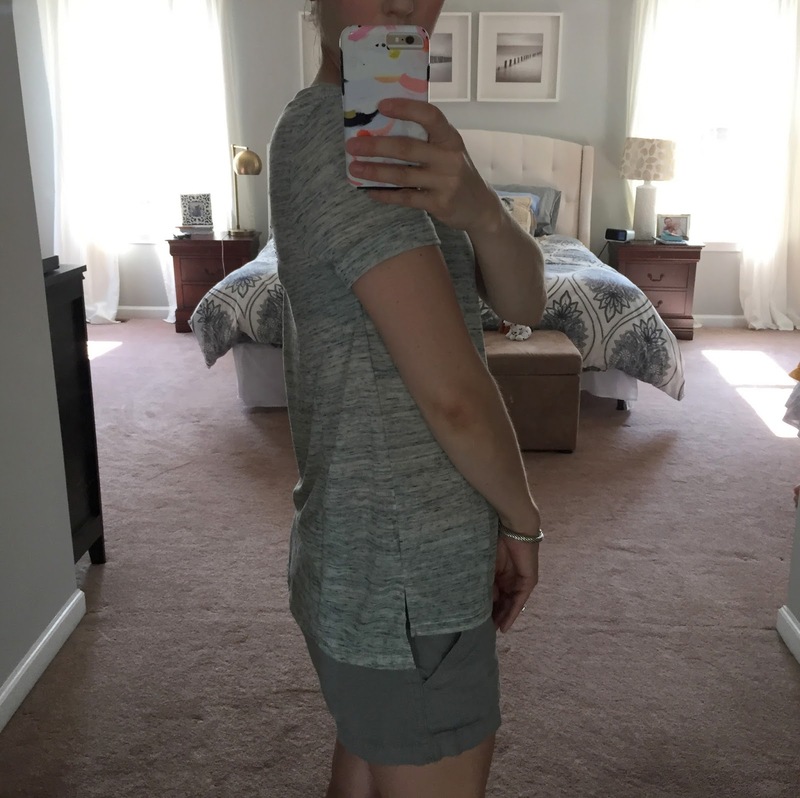 I thought it would probably hit me at the weird spot between my hips and waist and just overall would have a fit issue. Surprisingly, I didn't really notice it too much when on and seemed like the cut was flattering. 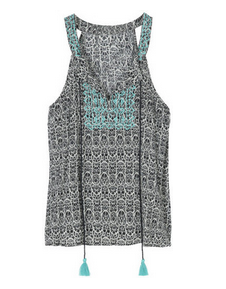 While the actual tribal inspired print isn't my favorite, I do like the black, white, and aqua combo. This is a top I can see myself wearing on days wear humidity is high. 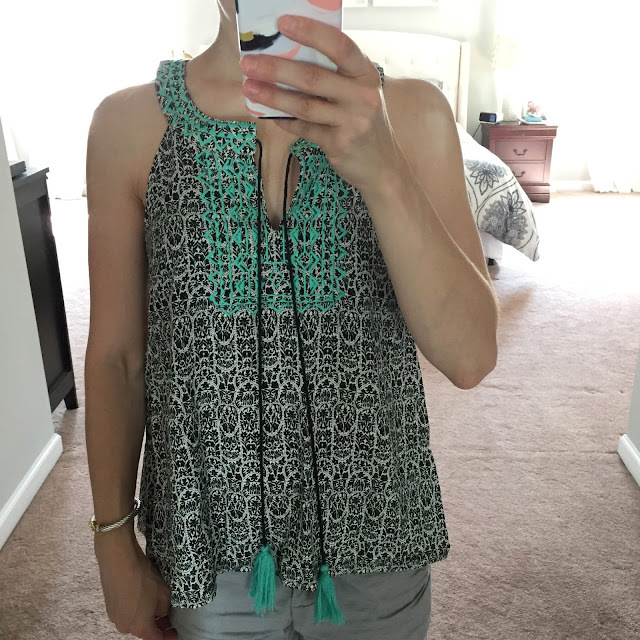 Even though it's rayon and not cotton, it's breezy, lightweight, sleeveless and doesn't cling or require a cami. I can definitely see myself wearing this with jeans out to a casual dinner or over to a friends for a BBQ. It's basically exactly what I was hoping to receive in this fix, but I'm not 100% in love with it. I want to try it on again with jeans/jean shorts to make sure the gray shorts weren't playing an optical illusion with the hem length. It also keeps the kids entertained. Verdict: Currently undecided, but leaning towards returning. Even though I hoped to get a stylish casual tank for summer in this fix, for the price I feel I could find something a bit nicer quality or grab something similar on sale in a few weeks when all the summer stuff gets slashed to make way for Fall arrivals. 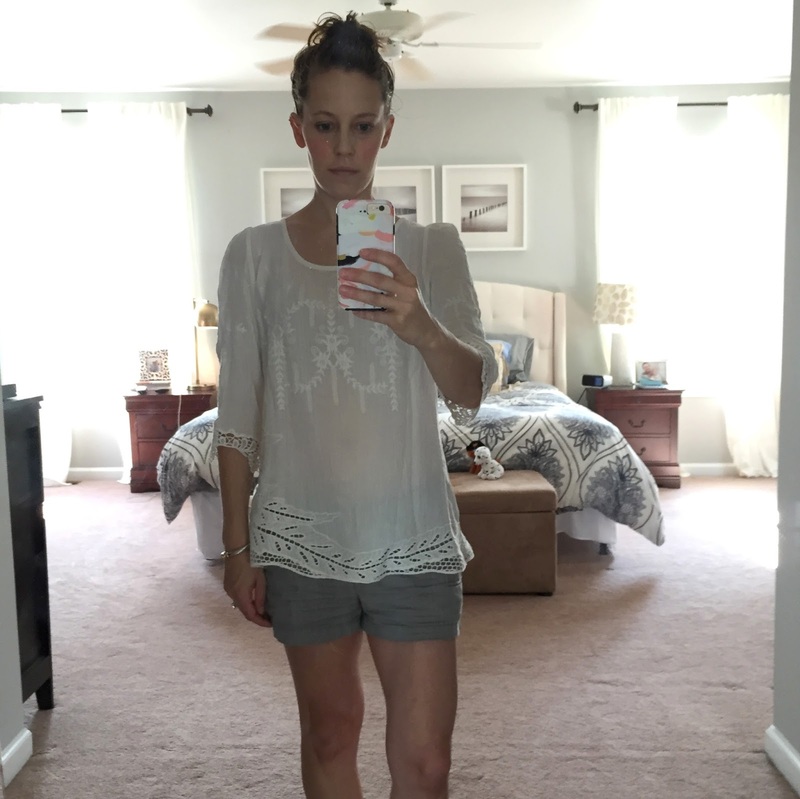 I tried it on again to take pictures for the blog, and definitely hated it less. 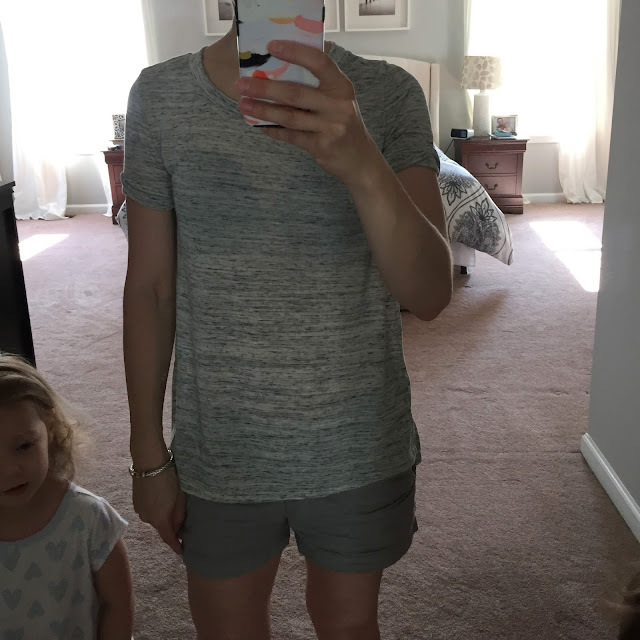 I thought if for some stroke of luck I decided to keep multiple items, I would throw it in for the extra 25% off total, because even though I wasn't in love with it, I can see myself throwing it on frequently to run errands and head to kiddie activities. Of course, that's generally what I do with my J.Crew v-necks that are fraction of the price. Of course, now looking at those pictures, I'm less than thrilled with the cut and sheerness. Definitely don't think it's worth it's price even if I plan to keep the other items. 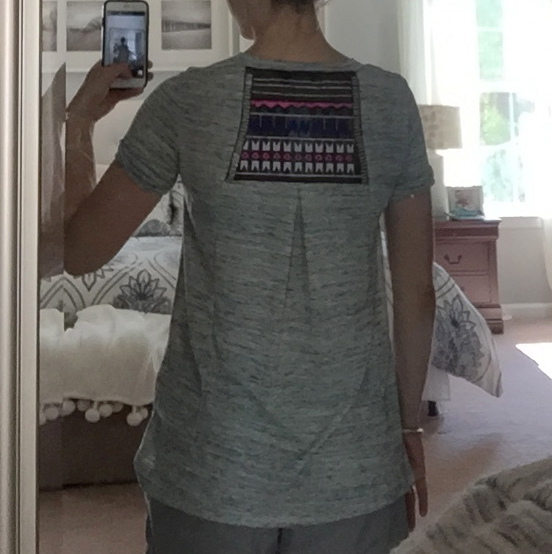 Pushing $50 for a knit tee is just ridic, embellished or not, they aren't diamonds. 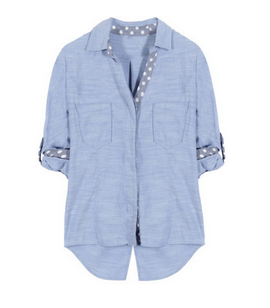 This Skies are Blue Jayda Dot Cuffed Chambray Top ($58) was the next cotton top. 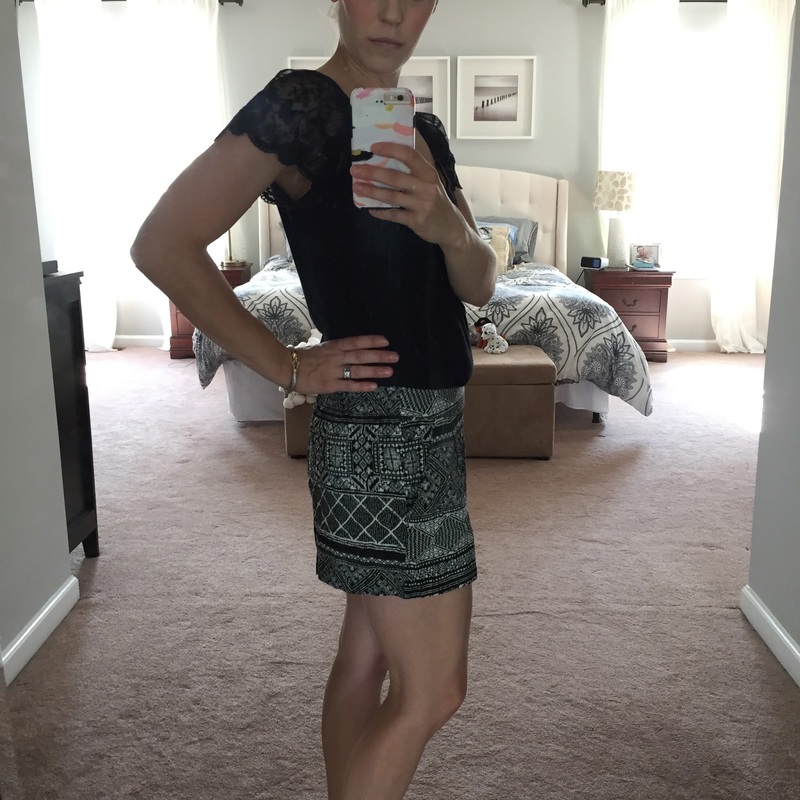 When I saw the style card I thought if it wasn't for blogging, I might not even try it on. Considering I just bought a chambray shirt (a bit darker) and I didn't love the split tail detail in the back. The polka dots seemed a bit too much. And just basically, thought this was completely ruled out. And once again, I put it on and actually liked it! It's really comfortable and despite the shirt tail thing, It feels a bit preppy on which I like. I also like that it will transition to Fall. 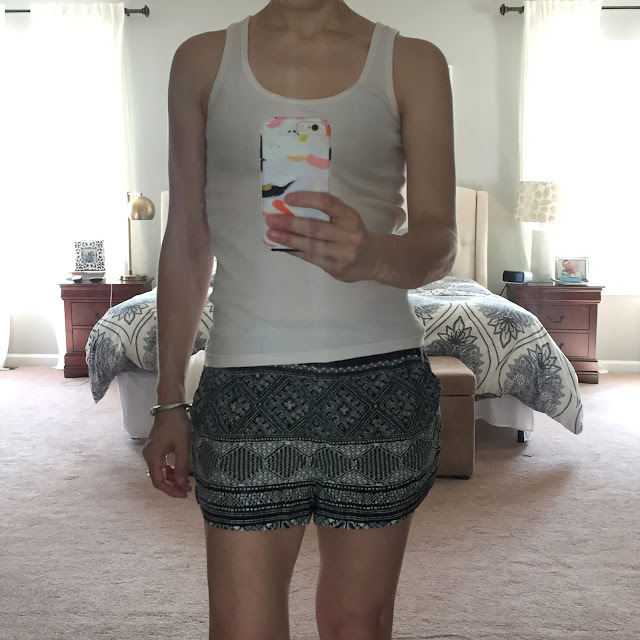 Another one to try on again, but I'm pleasantly surprised and can see it becoming a staple - easy to wear with canvas or denim shorts, white jeans, skinnies and boots.... I'm slowly talking myself into it. 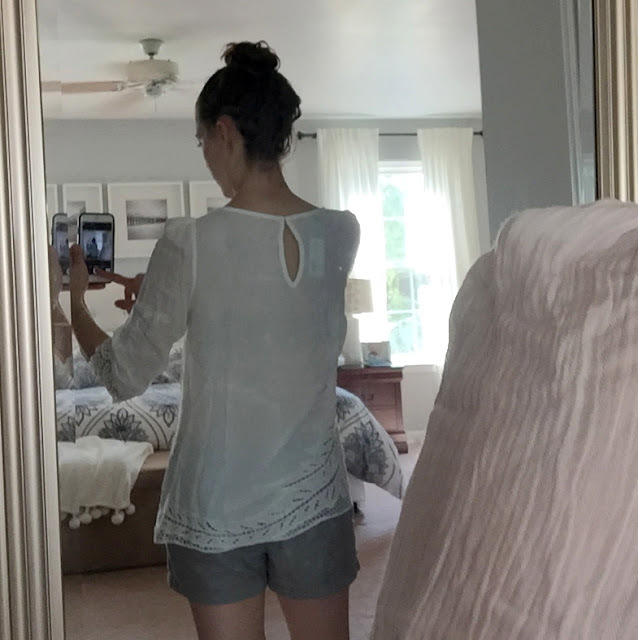 Last cotton top is the Brixon Ivy Diaz Embroidery & Crochet Detail Cotton Top ($74). Rachel said she included this one specifically since I had a similar crochet gem on my pinterest board. I knew immediately from the outfit card this would probably be my favorite. 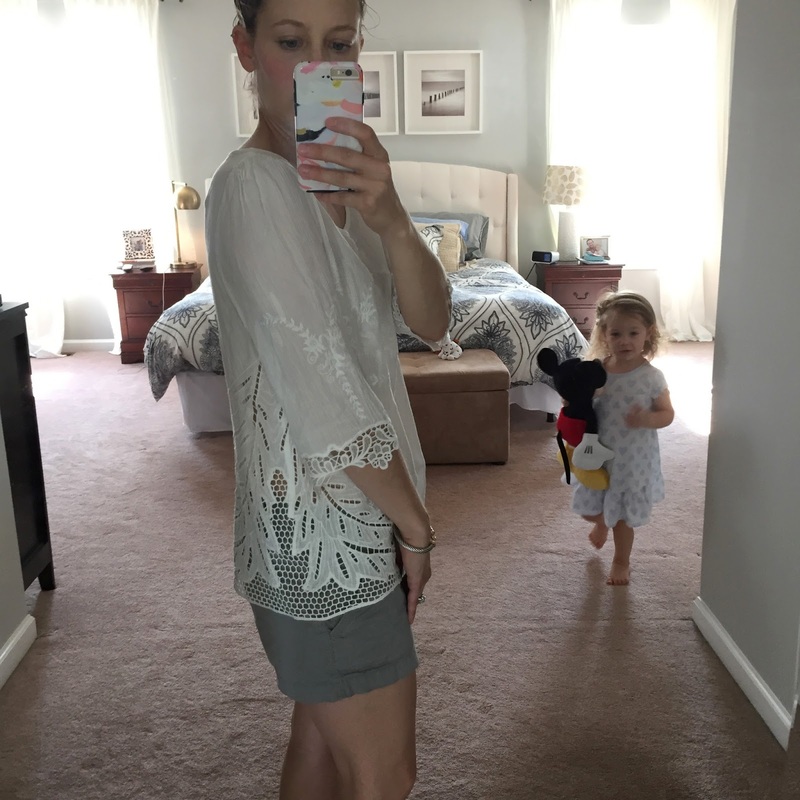 A flowy blouse, with details, and white (a favorite color of mine to wear despite children). This also made me assume it'd naturally be the priciest in the box. (I was right). Because of that, I was almost hoping that it would have a bad fit and just not be flattering. Nope, I really like it. However, as much as I love blouses and have a bit of a collection now, I find a lot of them I don't wear frequently. 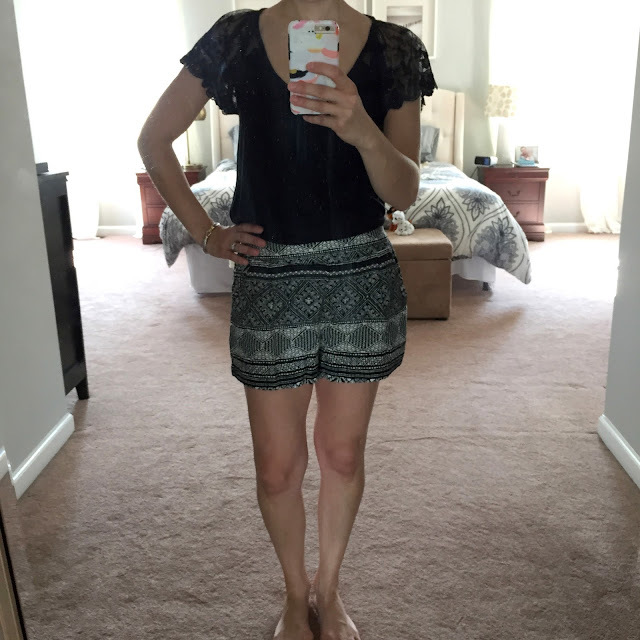 Of course, my two favorites are from Anthropologie and were both a pretty penny so I think I usually just save them for special occasions and the two I've previously kept from Stitch Fix are poly blends and just not right for summer. 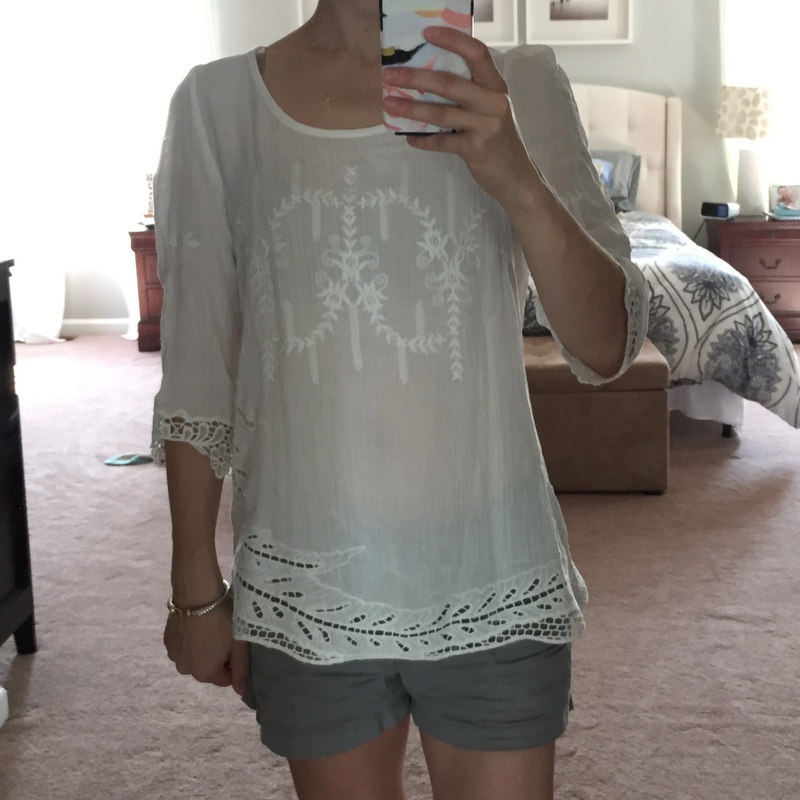 I'm trying to be mindful if I will actually wear it, but it is another top that will last into Fall. And I would definitely wear a cami underneath, as I usually do with almost everything I wear, just sayin'. 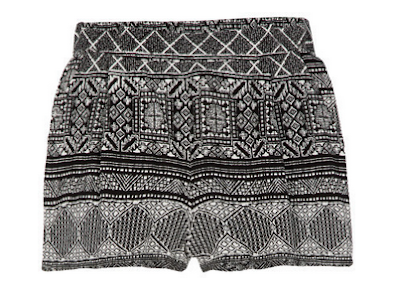 Last up, a pair of shorts, Skies are Blue Nessa Printed Short ($44). Rachel actually mentioned to wear the Papermoon shirt above with them, but that didn't overly wow me as a pairing. When I first saw the shorts, I didn't really think they were "me", but I'm glad they sent them since I've been wanting to branch out from chino and denim shorts. However, I've been intimidated to look at shorts like this because I'm afraid they would fit and look like workout shorts or pajamas. Again. I love them. They are so comfortable, I might just wear as them as pajamas once their fashionable time is up. While not the most luxe fabric, they don't feel cheap and the cut is perfect for my body. The waist band is elastic in the back, but flat in the front and it just sits on my hips perfect. There are pockets too, but they lay so nicely I didn't even notice them right away. I like that they'd be cute to wear out dressed up for a summer date night, something I have trouble with since I really don't wear dresses and jean or chino shorts a bit too casual to dress up. But they would also work really great on heat wave days where I don't want anything heavy or sticking to my skin. They would look just as cute with a plain tank or tee. 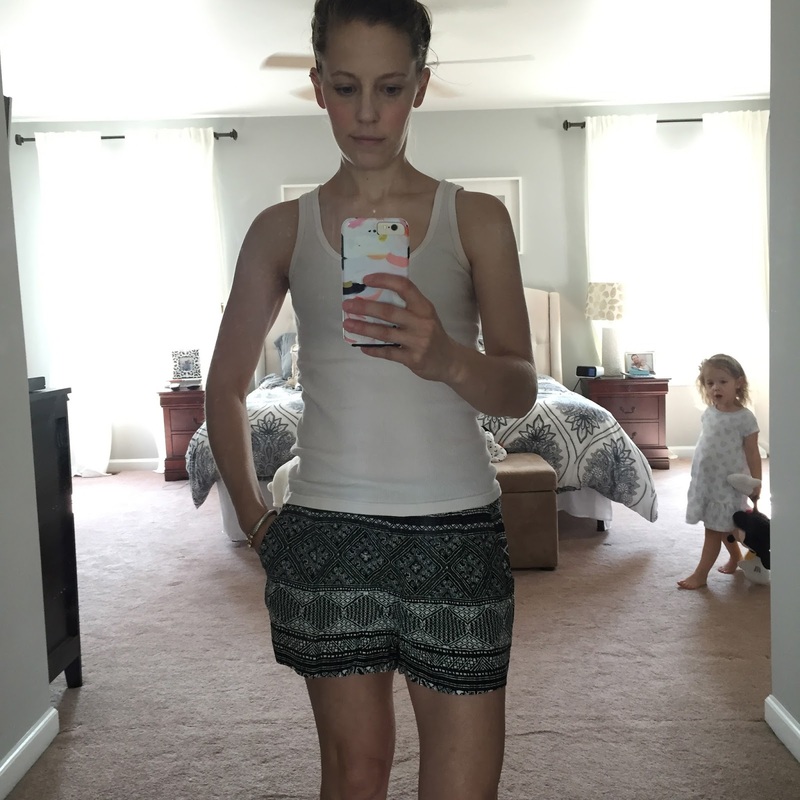 Overall, it's a battle between the white blouse and shorts as front runners. The most and least expensive items. I'm going to decide if I'm going to keep more than one... and if I do, then possibly a third or fourth. What do you think, I would love some opinions!!! Just some great articles from the last month or so I enjoyed reading, maybe you will too!! 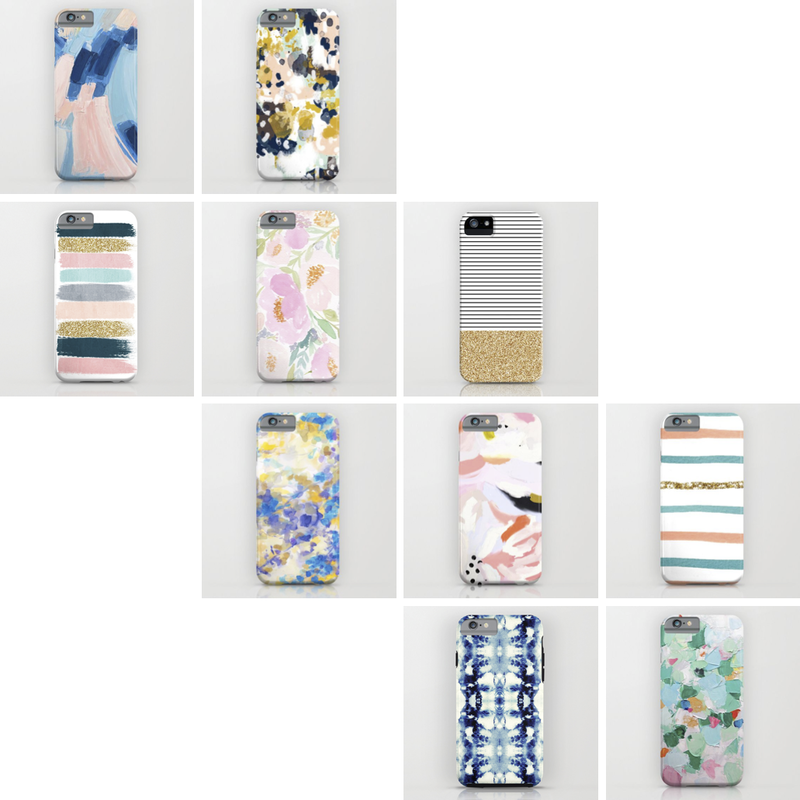 i've followed Sydney's blog for years, and while her posting has dwindled, the quality has not. Even when sponsored, she doesn't phone it in. Both these articles have great tips and tricks, and if you haven't followed her, please take a gander. 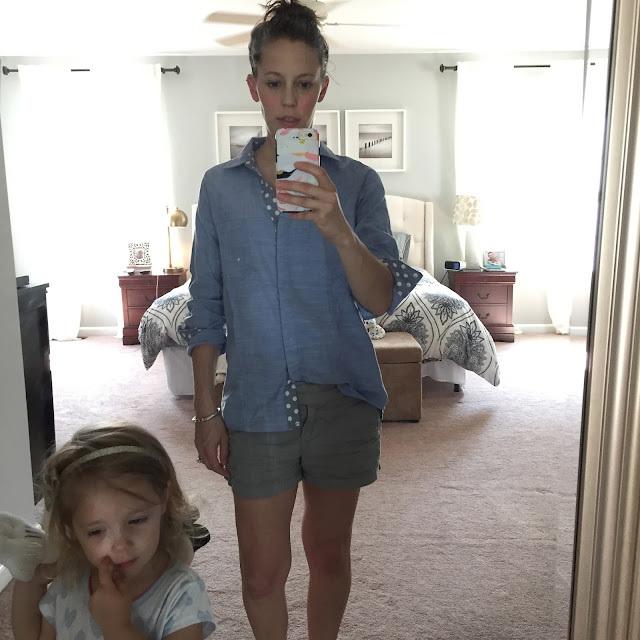 She is one of those bloggers who just has perfect combination of both eloquency and humor. seriously, i feel enlightened. These stores give me the sweats, well not Target, but any store with racks upon racks of different styles. It's like ordering food at Cheesecake Factory, too many choices, and either one, store or restaurant, most of the choices will probably just enhance my thighs. obviously from my IG photo dump posts, Studio McGee is one of my favorite interior designers. I found this article through their blog, and rushed over since we were right in the midst of our reno at the time. I was bit surprised that i actually had included a lot these tips. Either all the IG stalking is paying off, or I'm just a genius. Let's go with the former. I actually got to this link through Cupcakes and Cashmere's weekly Links I Love, but I love this type of stuff. I would be "Chloe" if spelling Erin the traditional way, #18 on the list for my year of birth. Going by my actual spelling, I'd be "Avianna". Also, totally don't forget to scroll down for the names of the decades, i'm rocking Phyllis, Edna, Gertrude, and Myrtle in the first half of the 1900s. And if you're not in the mood for reading (not sure why you are here? ), then enjoy these little snippets of our life. You can find me hunting down ear plugs.... and plastic forks. Check your volume, you've been warned. 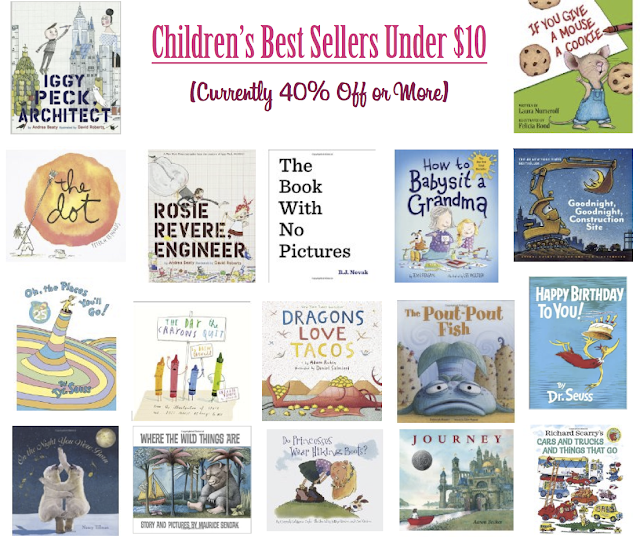 I was planning a weekend update post, but I got a flurry of Amazon alerts for some of the children's books I've been watching for price drops and ended up finding that a bunch of best sellers are currently 40% off or more. All these finds below are under $10, but there are bunch more with discounts. If you looking for a birthday or baby shower present, consider grabbing some now while they are cheap, or of course adding to your own library (I grabbed Iggy Peck Architect, we love Rosie Revere Engineer - or as Ashlynn calls it "Wosie DeBeer"). Also, did you know Target price matches?? If you grab any of these titles at Red Store be sure to pull up the amazon price on your smart phone at check out! Flamingos and pineapples aside, peach is the color of summer (as dubbed by me!). As most know, I'm a bit of an anti-pink girl, but I'm loving the the abundance of peach for the season. 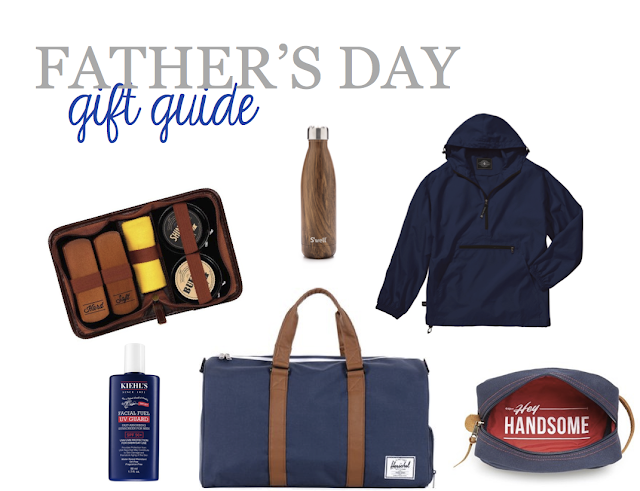 I'm pretty dying over everything picked above, especially the duffle and beach bag. I really could stand to replace both of mine which I've had since college (husband, do you hear me??) And does the Sandy Toes pullover come in adult sizes, because I might just hunt a XXL. Life's a Peach, err Beach! What's your color for summer? ?